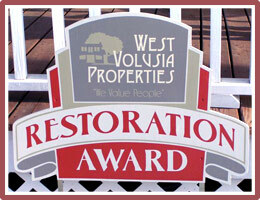 The West Volusia Properties Restoration Award was given quarterly to residential or commercial property owners who diligently persevered to restore a building. Each recipient received a $50 gift certificate from Feasel's Paint and Glass, a copy of Images of America: DeLand, and a framed certificate with a photograph of their building. It is often cheaper to tear down and rebuild rather than restore an older building; however the reward of owning an older structure with its quality material and pride of workmanship often outweighs the expense. Those who have restored older buildings recognize that one can make an estimate on projected work but more often than not the final cost of remodeling is double or triple. But in the end architectural history has been saved for future generations to enjoy. These recipients displayed true commitment to preserving America's architectural past and in so doing enhance their community for present and future generations. Their hard work, expense, and energy are deeply appreciated. Judy Bushee, former staff, Jean Kovac, client, and her rescued baby, Thelma). 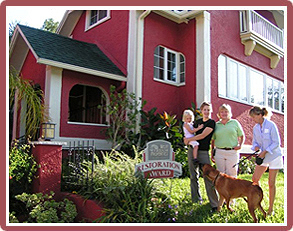 FloridaWild Veterinary Hospital is the most prestigious family restoration project ever completed in DeLand. This award-winning project was undertaken by the Hall Family beginning October 2000 and ending October 2006, 6 years and 28 days of non-stop demolition, reconstruction, and restoration. These three derelict buildings in downtown DeLand were adaptively rehabilitated for Maggi and Ron Hall's youngest daughter, Erin, to be used as her veterinary hospital. With over 6,000 square feet this state-of-the-art facility contains five exam rooms, a grieving room, acupuncture room, two reception areas, a cat waiting room, veterinary offices, lab, avian treatment room, surgical suite, pharmacy, holding area, and additional treatment areas. Two of the buildings are Arts & Crafts Bungalows constructed in the 1920s. The third building is Spanish Mission architecture. An addition was completed in 2007 connecting two of the buildings. The contractor and designer for the project, Maggi Hall, received the "2006 Florida Trust for Historic Preservation Individual Achievement Award" for this endeavor. In 2008 FloridaWild expanded into 441 S Woodland, adjacent to the main building, and the former office for West Volusia Properties. This new facility offers accommodations for cats, birds, and exotics. It has a wide range of speciality items for pets, and spa and massage treatments, as well as classes in pet care. To learn more about this extraordinary project visit FloridaWild Veterinary Hospital then go to the facilities button and restoration project. Seeing is believing. And if you're in the market for the best veterinarian around, stop in. Dr. Holder treats domesticated animals, birds, exotics, and wildlife. Her work with wildlife is pro bono.